These taste wonderful and the recipe is flexible as you can use seasonal greens. Cut veges into similar sizes, snap woody ends off asparagus. 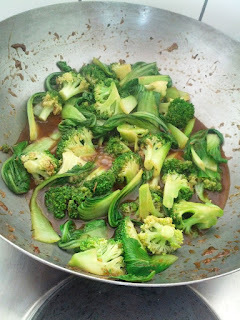 Place veges in boiling water for 30 seconds then drain. Heat ginger in a wok with sesame oil over a med-high heat for 1 minute. Add remaining sauce ingredients & cook for 2 minutes. Add vegetables and toss through sauce. Cook for another minute until heated through. I served mine with Lamb Cutlets. Enjoy!